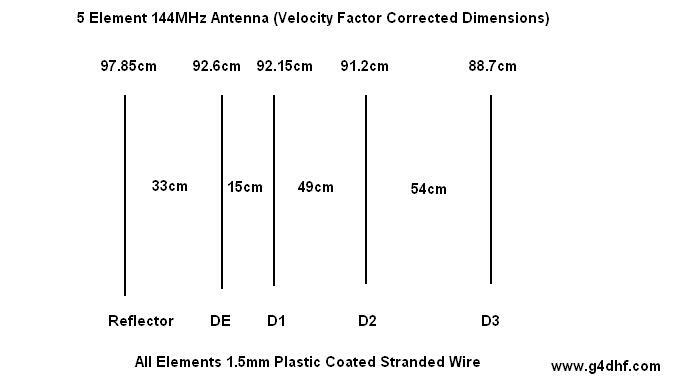 Please feel free to build or distribute the information on these antennas. G4DHF retain the copyright to the designs and ask that they are not manufactured for commercial gain. 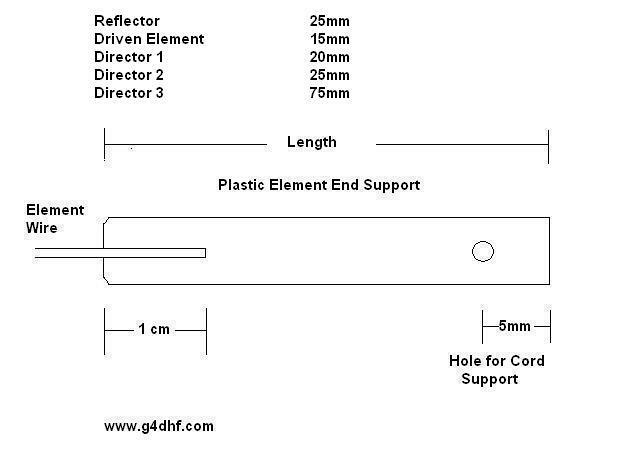 This is a design for a 5 element 2 Metre beam with a forward gain of 8dBD and a front to back ratio of over 24dB. As with my fishing pole yagis, it has a feed impedance of around 50 ohm and so the Driven Element only requires a simple unbalanced to balanced feed. 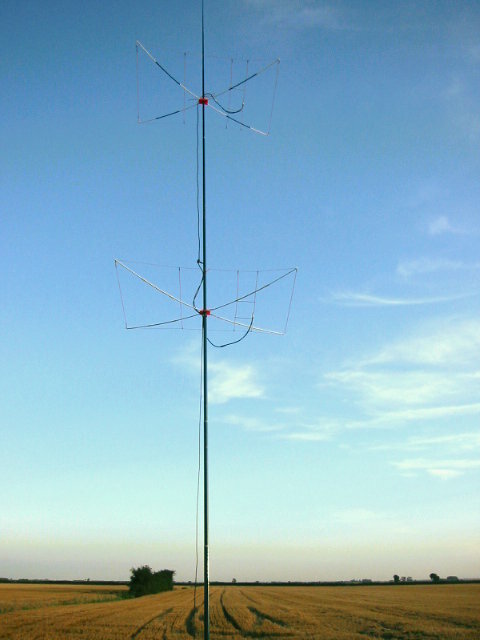 The antenna utilises flexible plastic coated wire for the elements, which are supported by fibre spreaders and kite flying cord. 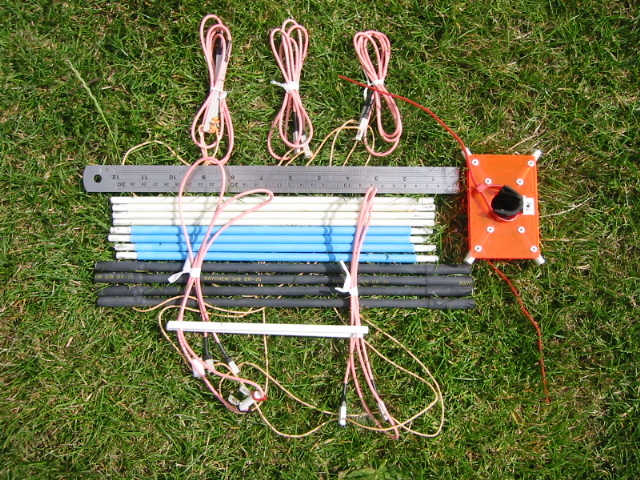 When assembled the antenna forms a rectangle of only 1 x 1.51 Metres. When not in use the antenna collapses into a very small package, which can be carried in a medium sized pocket or small bag making it ideal for backpacking. I have successfully carried these antennas as hand luggage during air travel and worked some quite remarkable DX. This yagi is designed using highly flexible 16g plastic coated wire with an outer diameter of 3mm and a stranded inner conductor of 1.5mm and is of the type readily available from most electrical retailers. The plastic coating has a significant effect on the resonant length of the elements due to changes in the velocity factor when compared to free space values. The value of the velocity factor was determined by trail and error over a period of many weeks and several yagis. A correction factor of around 7% to 5% from the free space values gave repeatedly good results and a value of 5% has been applied in this design. If a different wire diameter is used or the wire is non-insulated changes to the length of each element will be required to compensate. As the elements are very thin it was expected that the operating bandwidth would be limited to around a few hundred kHz at 144MHz. As the operating frequency was designed around 144.1 MHz this should be of little concern to those operating in the European DX section of the band. In fact, the beam will give creditable performance up to around 144.6 MHz after which the 50 ohm feed impedance, gain and front to back ratio rapidly begins to deteriorate. 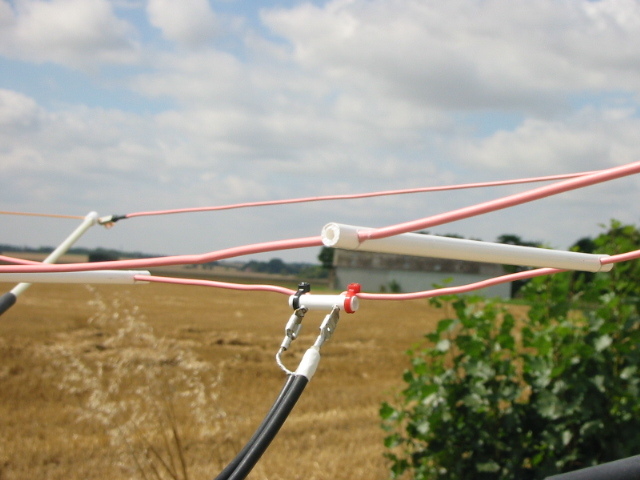 The elements are held in position along a string frame, supported by four 6mm fibre spreaders. A number of string types were tried, ranging from 1.5mm polypropylene line to the more conventional household twine. Almost all exhibited an unacceptable memory affect, which turned the beam into tangled wire when the supports were removed. The ideal material was found during a visit to a kite shop when 2mm flying line was purchased. This consists of hundreds of fine nylon strands bound together in a woven cotton outer sheath. This cord is highly resilient to stretching, has minimal memory affect and is extremely strong. Once used there was no going back to the types used in the prototypes. The end of each element is secured into lengths of 5mm plastic hollow tubing, obtained from model and craft shops. Each element end support has a different length in order to preserve the shape of the supporting frame. After the tips have been drilled each element is threaded along the length of the cord to their correct position. The end of each element is at a high RF voltage potential so care needs to be taken to ensure that surrounding objects and materials due not exhibit detuning effects. 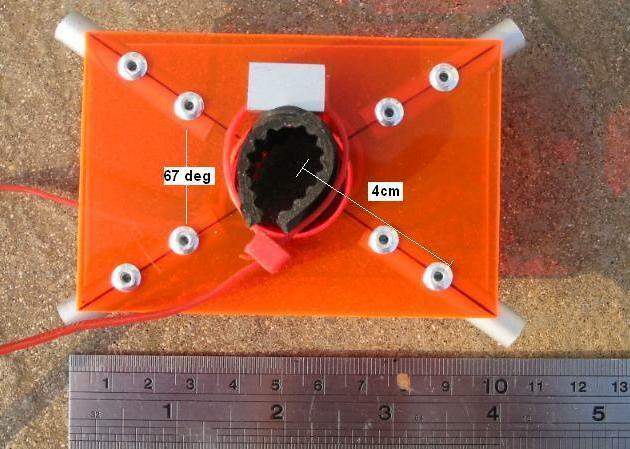 Four small lengths of 2mm plastic rod terminate each of the supporting frame by providing tie points for the cord. The Driven Element consists of a simple dipole. 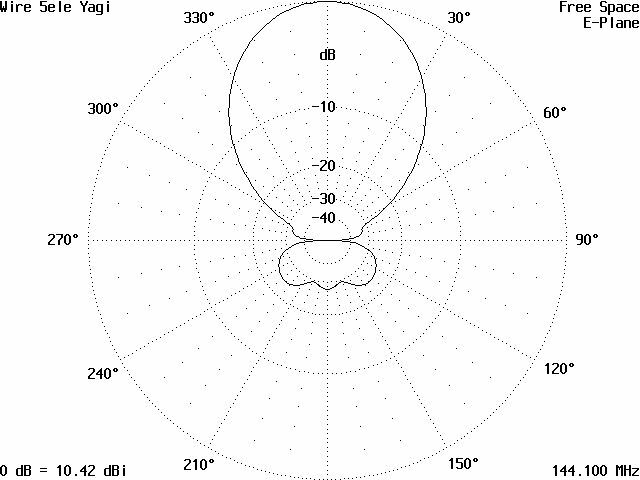 The feed impedance for a conventional yagi is usually considerably lower than the desired 50 ohm feed and requires some form of matching network to compensate. 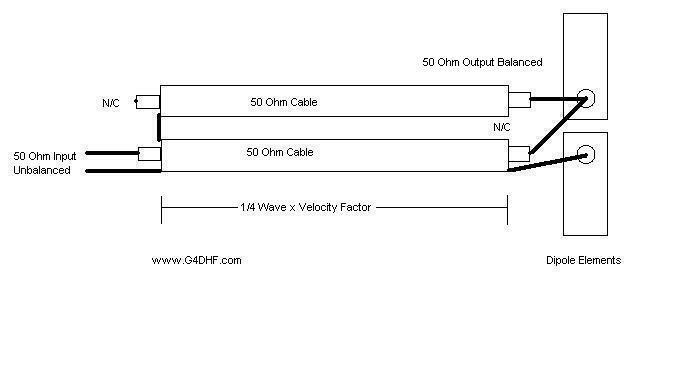 This design sacrifices a few tenths of a dB of forward gain so that by careful attention to the length and position of the first director in relation to the dipole the feed impedance is raised to the desired value. This concept is not new. 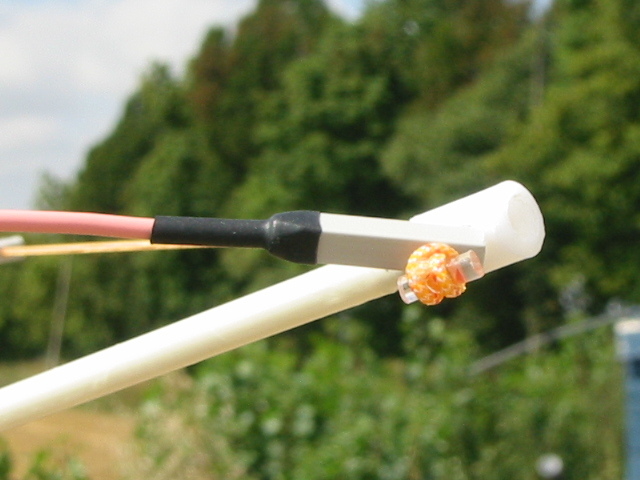 Indeed, at least one well-known commercial manufacturer of V/UHF antennas has used this technique successfully over many years, including matching UHF folded dipoles directly with 50 ohm cable. These parameters are, however, quite critical and so careful attention should be given to ensuring that the recommended dimensions are followed. 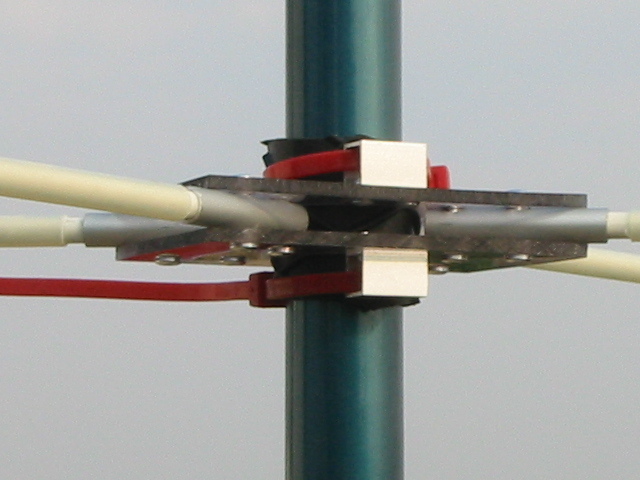 The centre of the dipole passes through a small plastic support and is terminated with standard spade connectors, as weight at this point needs to be kept as light a possible to reduce element sag. 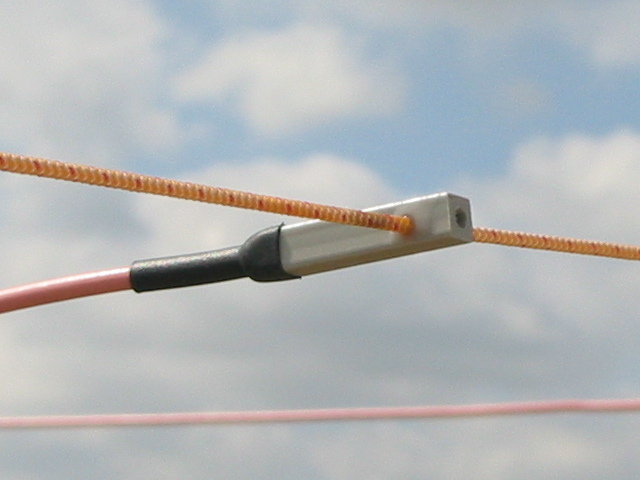 The dipole requires an unbalanced to balanced balun, which is described below. This balun serves to provide an unbalanced to balanced 50 ohm match, which helps reduce RF currents on the outer of the feed. Omit this balun at your peril as the antenna may exhibit false resonance at the desired frequency or high SWR due to the presence of circulating currents. For RG-58U coax with a velocity factor of 0.66, cut a 34cm length and trim back the braid 5mm at en end. Note that the two lengths run parallel to each other and that the braid and inner are isolated at opposite ends. 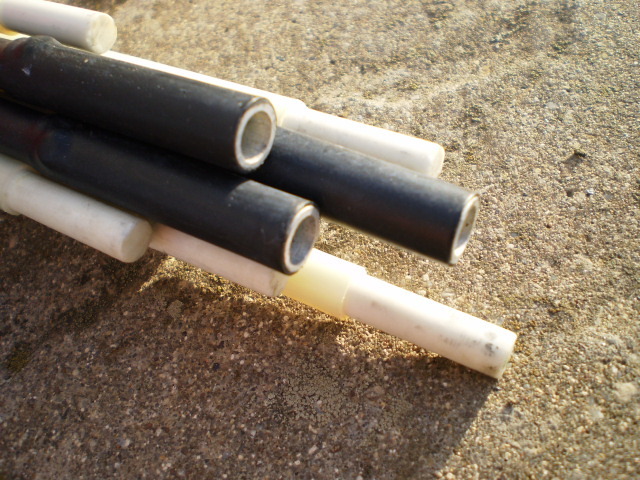 The end of each element is cut to the corrected length and secured into plastic element spacers, which are drilled 5mm from the tip and threaded onto the two outer lengths of kite cord. The element positions are marked out onto a length of wood and the cord stretched between two sets of panel pins. Thread one end of the Reflector element first, followed by the plastic end cap that holds the fibre support. When the beam is assembled these caps hold the Reflector and 2nd Director tight against the end supports. Next thread the Driven element, Director 1, another end cap and finally Director 2. Repeat the process for the opposite side. When the fibre supports are inserted into the end caps the beam assumes it’s physical dimensions. The element ends can be glued along the cord, but leave Director 1 free until adjustments are complete. 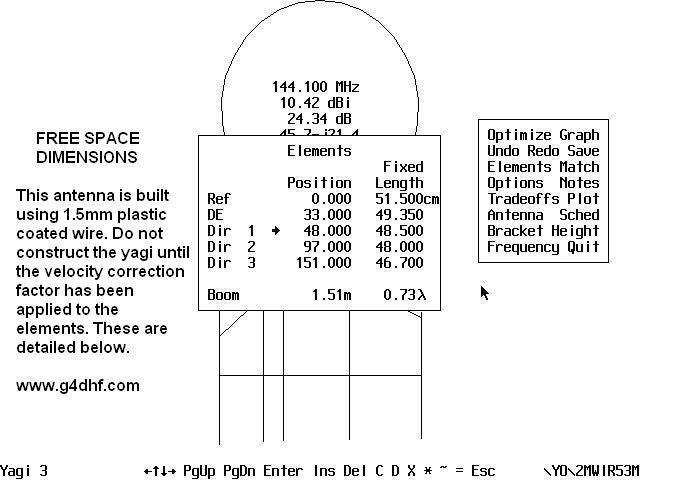 The shape of the yagi is created when the four fibre supports are inserted into a central hub and the four plastic end caps at each corner of the beam. 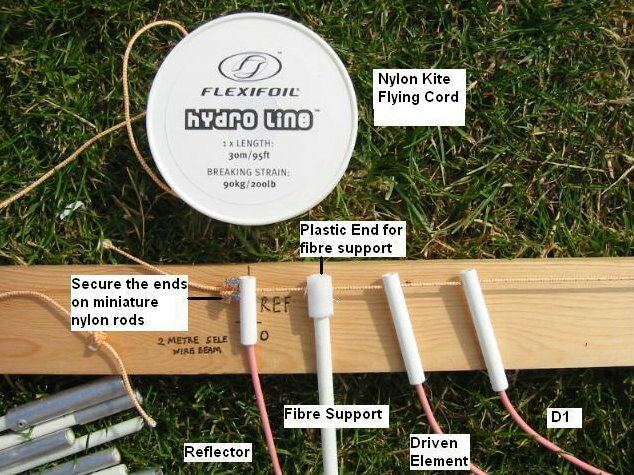 Lengths of 6mm fibre rod are available from a DIY stores and kite retailers. I have even successfully used the types that support bicycle flags. The total length of each support is around 865cm, which I cut into three sections for portability. There is an additional 4cm of “hidden” length to be added when they are fitted into the central hub. I placed small lengths of 8mm (6mm ID) aluminium tubing on each end of all the second sections to enable the rods to be compression fitted together. A word of caution is necessary when handling and cutting these rods as fibres can easily become embedded in the skin causing irritation so gloves must be worn. When the rods have been cut each end should be dipped in “Super Glue” to prevent the fibres from peeling. Furthermore, the addition of heat shrink sleeving makes for safer handling. It is not recommended to use wooden dowel for the supports as the tension required to form the structure is quite high and this will either distort or snap the wood. This yagi has to be lightweight, strong and portable. Metal fixings are almost eliminated. The supporting plates consist of two 9cm x 7cm sheets of 3mm acrylic. The geometry of the structure is scored on one of the sheets to determine the centre. Mark the 67-degree angle created by the fibre supports. The sheets are held together with the markings on top so the centre-supporting hole can be drilled. 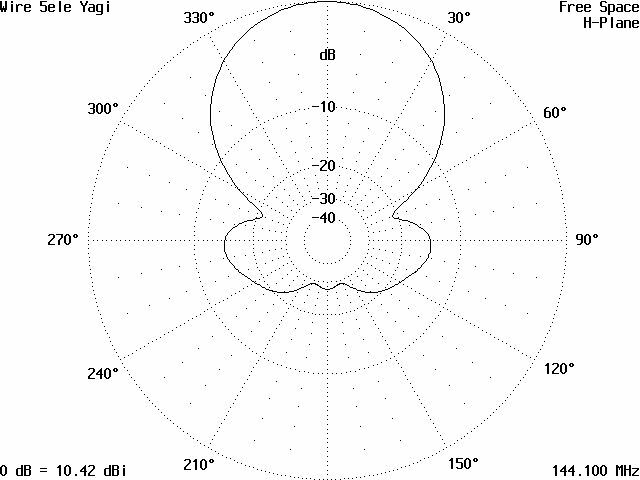 If two stacked antennas are planned, supported by a 6 metre to 9 metre fibre pole, the top antenna has a hole diameter of 2.5cm while the second, located some two metres lower has a cut out of 3.5cm. The four 4cm lengths of 8mm aluminium tube that house the fibre spreaders are then pop riveted in place. Turn the support over and secure the reverse. Two small “L” shaped aluminium brackets (or square open section) are formed and secured either side of the plates. These support a length of ribbed rubber matting, which, with the additional of cable ties, increases the grip between the central support and the mast support. There may be concerns regarding the effect of sunlight on acrylic over time but because the yagi is intended for temporary use the trade off in weight, strength and ease of assembly more than compensates for this potential problem. Attach the antenna to an insulated mast at a comfortable working height of between five to six feet above ground in a clear environment. 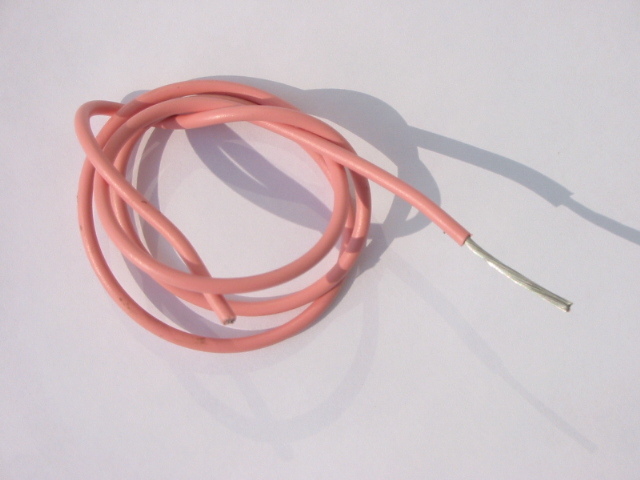 Attach the ends of the coaxial balun to the Driven Element and connect a length of 50 ohm cable to either an antenna analyser or SWR meter connected to a low level (1 watt max) 2 Metre signal source. 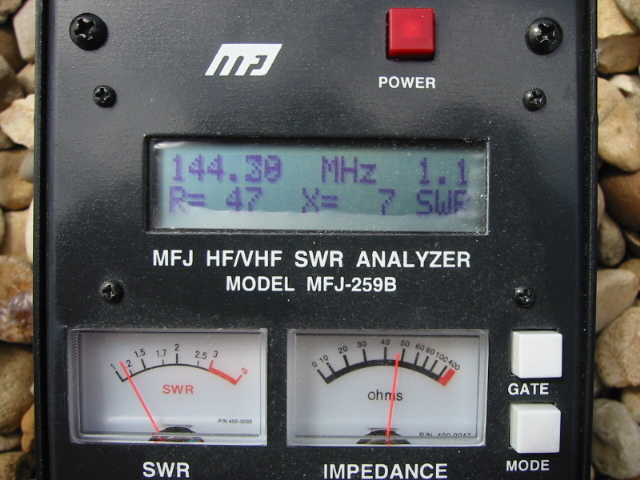 Note the impedance or amount of reflected power. If the dimensions of the beam have been followed closely these will be reasonably low and close to 50 ohm. Moving only the position of the first director in 2mm steps, usually towards the Driven Element, note the change in impedance until the desired match is achieved. The antenna can now be raised to a more suitable operating height to confirm alignment. When complete, the position of D1 is marked and secured. 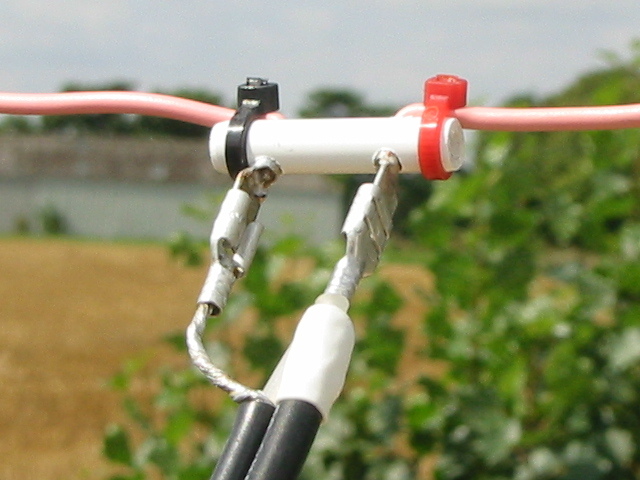 Lengths of lightweight plastic placed either side of the dipole centre help to maintain this distance, which is critical, when the elements sag slightly in operation. Once aligned and the distance between D1 and the Driven Element has been secured power levels of up to 300W have been used successfully. As has been previously suggested, stacking two or more of these beams is perfectly viable due to their low weight. Stacking two antennas at a distance of one wavelength (6′) should yield a forward gain of about 11dBD, which makes for quite a potent one-person system. 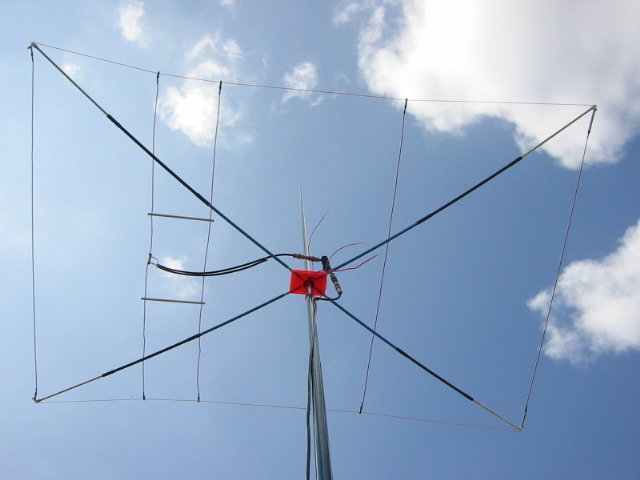 Readers may be interested to know just how effectively this type of antenna can perform. While testing one of the prototypes in the garden of my QTH near Spalding (IO92UU) in May 2005 we had a Sporadic “E” event late in the afternoon. I worked CN8LI (IM63) at a distance of 2163Km, EA9IB (IM85) 1966Km and several EA7’s running only 20W. Given the high QRM levels and the number of G stations who were active, these results speak for themselves and should encourage potential builders to “get busy”. 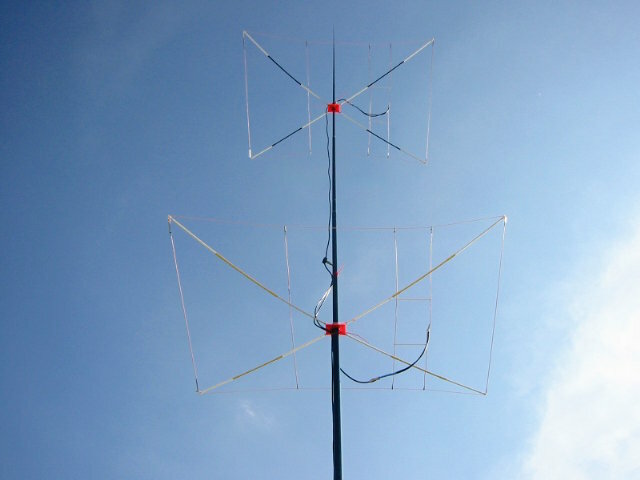 I would be interested in receiving comments and details of your operating experiences using this type of antenna. Your balun diagram is wrong for the dipole, you show the centre core of the stub connected, it should be the braid connected at both ends forming a pawsey stub, the inner core is not used.